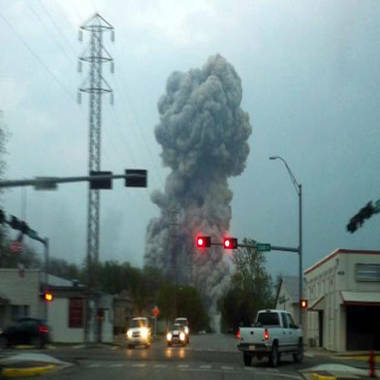 Authorities in the small community of West, Texas, which was stunned by a massive explosion in a fertilizer plant on Wednesday, are searching for survivors and clues about what caused the blast, believed to be an accident. Searches resumed at a fertilizer plant early Friday after residents of the Texas town devastated by an explosion gathered to mourn their community's losses. A non-denominational service was held at St. Mary of the Assumption Catholic Church on Thursday night. The Rev. Ed Karasek said that the town "will never be the same, but we will persevere." He added: "Our hearts are hurting, our hearts are broken." Officials have said as many as 15 people may have died and more than 160 others were injured in the blast, which occurred just before 8 p.m. local time (9 p.m. ET) Wednesday in the farming town of West a few miles north of Waco. "The area around the site is just total devastation," Texas Attorney General Greg Abbott said at a news conference Thursday night. He said an apartment complex that was flattened "looks like it was a bombing site of an explosion the kind that you see in Baghdad." Police initially said between five and 15 people may have been killed, and Mayor Tommy Muska, a member of the town's Fire Department, told NBC News that he feared those numbers could double. But state officials said it was too soon to say how many had died. Despite the lack of official confirmation, The Associated Press reported that the names of the dead were becoming known in the town of 2,800. "Word gets around quick in a small town," said local resident Brenda Covey, 46. Earlier, Sgt. Jason Reyes of the Texas Department of Public Safety said he could confirm that "we do have fatalities," but he refused to give any numbers. "You've got to understand, we are still in a search-and-rescue mode right now," he said. Tommy Muska, a volunteer firefighter and the mayor of West, Texas, which was rocked by an explosion at a fertilizer plant on Wednesday, talks about the search for survivors and how the town will move forward. 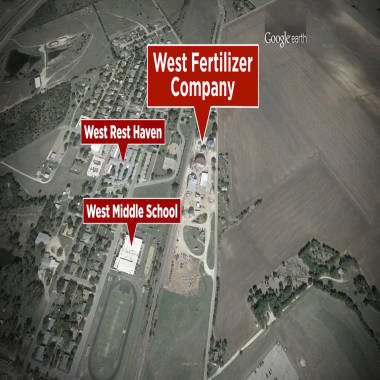 Matt Cawthon, chief deputy sheriff of McLennan County, said Thursday afternoon that the presence of dangerous chemicals at West Fertilizer Co., including ammonium nitrate, was significantly slowing the investigation. Agents from the state Commission on Environmental Quality and the U.S. Environmental Protection Agency were combing the scene "to determine just how dangerous it is for our first responders," he said. The cause of the fire and explosion remained undetermined, but there was no indication of criminal activity, Waco police Sgt. William Patrick Swanton said. The federal Bureau of Alcohol, Tobacco, Firearms and Explosives said it was sending the same National Response Team that worked this week's explosion at the Boston Marathon to lead the Texas investigation. "We do not know the number of any fatalities. We do not know where the fire started. We do not know the cause," Assistant State Fire Marshal Kelly Kistner said. The blast, which shook the ground with the force of a magnitude-2.1 earthquake, all but obliterated a five- to six-block radius around the plant, where two massive tanks held highly pressurized anhydrous ammonia. It wrecked about 50 to 75 homes and a middle school. A 50-unit apartment complex had its walls torn off and its roof peeled back. 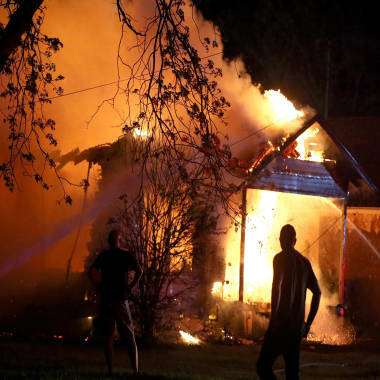 The huge blast rocked a small Texas town Wednesday, April 16, killing at least five people and destroying nearby homes. "It just sucked you in and just threw you to the ground," resident Crystal Jerigan told TODAY, describing how she grabbed her two daughters out of a car and dived through the front door of their house. "It was very difficult coming into work knowing my family may be coming into the hospital," Melissa James, a social worker at Hillcrest Baptist Medical Center in Waco, said Thursday. Her relatives suffered only minor injuries. The blast could be felt for miles. Sammy Chavez of West, who ran to the West Rest Haven nursing home despite being injured, told NBC 5 of Dallas that he found a surreal scene. "I just saw the explosion, and then after that I took off running, and then I saw the West home, and people you know were buried under the West home. The West home was gone," Chavez said. "It was gone. The school's gone. The apartments are gone. It's horrible." Smoke rises from the scene of a fertilizer plant explosion near Waco, Texas, on Wednesday, April 17..
Derrick Hurtt was in his truck, recording the fire from about 300 yards, when the flames erupted with a blinding flash, followed by a towering pillar of smoke. He caught the explosion on his camera, along with the panicked screams of his daughter Khloey, who begged him to drive away. "I'm pretty sure it lifted the truck off the ground. It just blew me over on top of her," Hurtt said on TODAY. "It all happened so quick that things kind of went black for a moment." West has only about 2,700 residents, but the affected area is a densely populated neighborhood, and "it is devastated," Cawthon said. But while the toll is "immense," said Abbott, the attorney general, "the other thing we clearly saw in touring around West is the clear sign of hope. You can see hope in the eyes of the rescue workers. ... You can see already the beginnings of the community working to piece itself back together." State officials said the plant had been at the site since 1962. Its state authorization lapsed at some point, but after a 2006 complaint about a smell of ammonia in the air, it came back into compliance, and there have been no more issues. Satellite view showing the location of West Fertilizer Co. in West, Texas. Police said that soon after the blast there was one possible report of a looting incident but that it was "not rampant," and no one was being allowed into the search area. There were also reports of price gouging, said Abbott, who promised that profiteers "will be facing a lawsuit by the Texas attorney general." In a statement, President Barack Obama thanked first responders, pledged support and offered prayers. "A tight-knit community has been shaken, and good, hard-working people have lost their lives," Obama said. Michelle Acevedo, Gabe Gutierrez, Edgar Zuniga Jr. and Matthew DeLuca of NBC News and The Associated Press contributed to this report.